Turkey's President Recep Tayyip Erdogan waves to the crowd during his first official campaign stop in Kahramanmaras, southeastern Turkey, Feb. 17, 2017, ahead of an April 16 national referendum on expanding executive powers. Protesters chant, “We want the death penalty|," as 40 soldiers are led into an Ankara court. The soldiers are accused of trying to assassinate President Recep Tayyip Erdogan during a failed coup in July, in which more than 250 people were killed. Erdogan, touring the country to rally support for an April referendum to extend his presidential powers, promised to bring back the death penalty. "If parliament passes the law to bring it back, I will sign it, and pay my debt to the martyrs of our country," Erdogan said to thousands of supporters in the Turkish city of Kahramanmaras Friday. The death penalty was abolished by Erdogan when he was prime minister in 2004 as part of the country’s bid to join the European Union; but its return would be popular among many nationalists and conservative voters who support him. The European Union has warned Ankara its bid to join would be automatically frozen, but, with that bid making little progress because of opposition from some members, there is growing resentment among many Turks toward the European Union. Erdogan said he is not going to listen to Europeans, referring to them as "Hans and George." At the Kahramanmaras rally, Erdogan told his supporters, “I listen to the Ayses and Ahmets of our country," referring to traditional Turkish Muslim names, while adding, "I listen to the words of God." 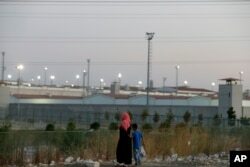 FILE - A woman and a boy walk outside a high security prison complex in Silivri, about 80 kilometers (50 miles) west of Istanbul, Aug. 17, 2016. Turkey abolished the death penalty in 2004 as part of its bid to join the European Union. Reinstating it would deal a fatal blow to its EU ambitions. Analysts say such rhetoric plays well with large sections of the electorate, underscoring his message of the need for a strong president with strong powers. Many, however, are predicting the death penalty issue will be quietly forgotten after the April referendum. Notably, Devlet Bahceli, the leader of Turkey’s main nationalist party, the MHP, has not, so far, echoed the president’s latest call. Analysts point out the return of the death penalty would inevitability exacerbate the country’s already deep political and ethnic divisions, if members of the Kurdish rebel group the PKK were executed. Any break with the EU would also threaten to further destabilize the country’s vulnerable economy. Pragmatism is being widely predicted to prevail over the death penalty, in the face of calls from Erdogan’s grassroots, and many nationalists; but, given the country is set to face a crucial general and presidential election within two years, few are predicting with any certainty the death penalty controversy will end soon.